Exciting changes are happening for the New Year! From the middle of January we will start with many new courses for beginners and more demanding dancers. 1. Zouk with Daniel and Jovi - beginners course starts on Thursday 17.01. 2. Belly Dancing with Jenny - 10 week course on Mondays starting from 28.01 for an amazing price of £30. Full classes timetable is now available. SILVER PASSPORT £35: 12 classes - valid for 4 weeks. 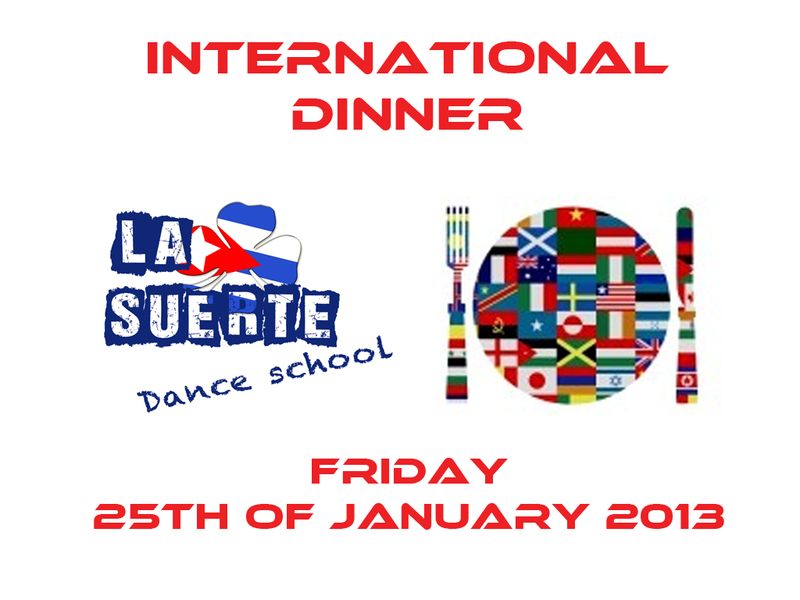 La Suerte Dance School will be closed 24-26th of December. Other days we are open as usual. Because of break at University Wednesdays classes will stop between 14th of December and 14th of January. 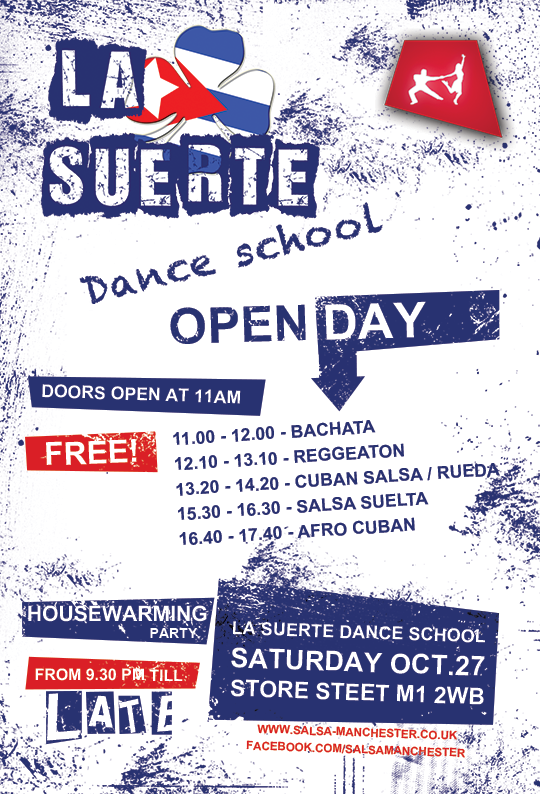 La Suerte Dance School OPEN DAY! There will be new social salsa event every wednesday at Revolution de Cuba. FREE entrance, new venue. It's worth do go and check. We will go there straight after our classes at International Society. 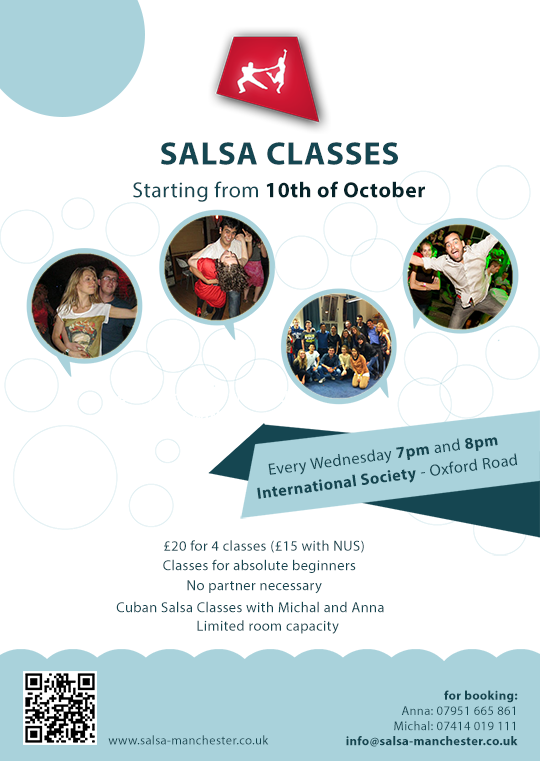 We restart salsa classes at International Society - Oxford Road (Manchester University) 10th of October 2012. There will be two groups - both will start form level 1 (absolute beginners). Classes will last 1hr each and start 7pm and 8pm. 7pm classes - start 10th of October. 8pm classes - start 17th of October. Classes will take place every Wednesday. Or just come to the first class and sign up then. Please notice only email registration guarantees we will have space for you during a class. We are coming back the week after. See you then. 1. International Society Salsa Classes - Summer Holiday. Because of the obvious reason (students summer holiday) we suspended our salsa classes at the Uni till the end of summer holiday. Restart date will be published soon. 2. 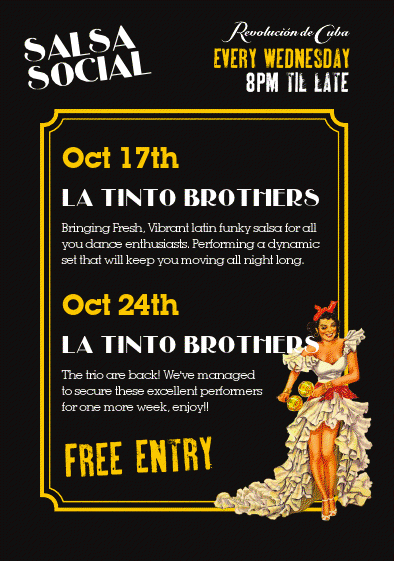 New monthly event - The Salsa After Party at Cuba Cafe. Usually second friday of the month (the next one will be the 10th of August). Party starts 12am and finishes 3am. 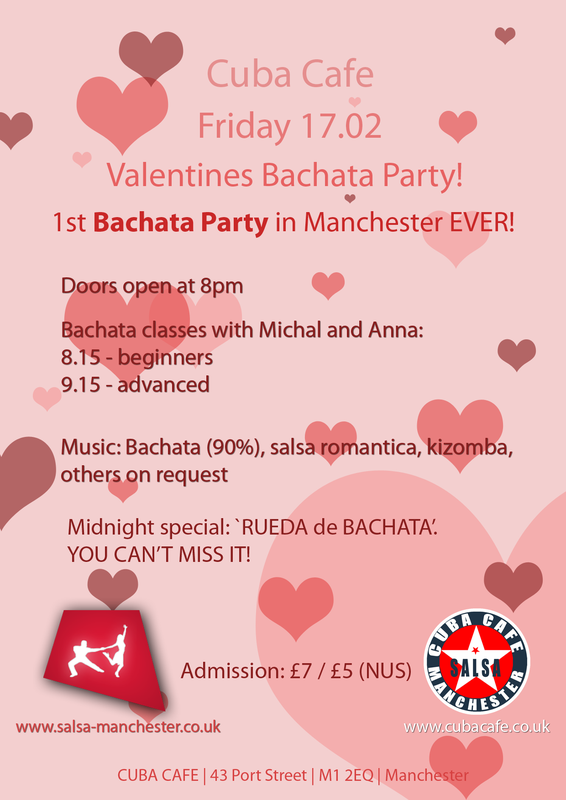 Music: Salsa, Bachata, Merengue, Reggeaton, Cha Cha from Les (ManCuban) and Michal (Salsa Manchester). Bachata Classes before parties as usual 8.15 - beginners, 9.15 - advanced (£5/class, £7/2 classes). For all attending classes, after party is FREE. Bachata classes are on all summer. Every Friday: 8.15 and 9.15. Bachata Social Dancing after classes. We are organizing a group for Cracow Latin Festival (cracowlatinfestival.pl/en). We can get discounts as well (no matter how many people is going with us). The festival is focusing around afro-cuban workshops with Alberto Valdes. Contact Us for more details. Salsa competition, Sierra Maestra concert and MORE! 1. 18th February - Manchester Universities Dance Competition 2012. Part of the event will be open salsa competition. Doesn't matter if you are student or not, doesn't matter what is your dance level. You should join it! 8pm - beginners NEW GROUP! I hope you have charged your bateries during this looooong break. We did and with a lot of energy we start new salsa season. New year's resolution - I will dance MORE! Chapel Street, Salford, M3 5DW. 7pm - Continuation for last year students. 8pm - New beginners class. YOU CAN JOIN BOTH GROUPS! Cuba Cafe will restart 1st February as well. Our first bachata class will take place Friday 3rd. This year we are going to introduce few intresting activities. There will be new reggeaton class, you can join our dance group, we are going to few Salsa Fesivals around Europe as well. More information to follow. Come and join us at classes around Manchester and learn how to dance salsa and bachata with salsa manchester.